I am on the east coast of the US this week visiting engineers who are designing some pretty cool stuff so this is just going to be a quick post. 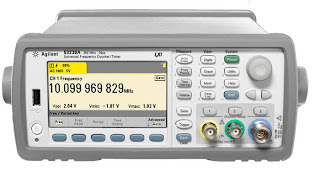 Back on Oct 17th I posted about Agilent's new 53200A series of universal counter / timers. Here I am going to talk about their graphing capabilities. In the past all a universal counter display gave you was a constantly changing long string of digits. Looking at this constantly changing long string of digits you could do a quick calculation in your head to figure out how far off you were from some reference value. Things that you probably could not calculate from the long string of constantly changing digits was how much random error is on my signal, is there multiple sources of random error, and is my systematic error changing with time. The histogram and trend chart capabilities found on the 53200 series of universal counters can give you information like that and more with a quick glance Below are two links to Youtube videos that provide an overview of the 53200 series histogram and trend chart capabilities. The actor that provides the overview in the video is also the designer of the features, enjoy. Hey all just wanted to let you know that I am in LA for SPI and if you are here too please come by Agilent's booth (5545) to say hi. I will be showing off our new SMU the N6784A. I will also be giving a presentation entitled "Maximize Efficiency by Properly Testing Your MPPT Algorithms and Hardware." I have noticed that my posts on photovoltaic test are getting lots of hits so here is another one. Here I am going to present a $3k photovoltaic I-V curve measurement system. 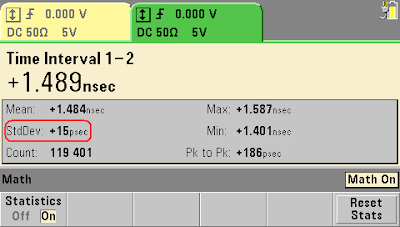 The measurement system can be seen in the figure below (click on it to enlarge it). Setting and stepping the voltage at the positive input of the op amp is done by the 34972A DAQ switch unit. It provides a DAC output from 0 to 15 V. When the DAC is set to 0V the FET is in an open condition and the PV panel is at Voc. Rsense is 100 mOhm precision shunt. If we set the 34972A's DAC output to .5 V the op amp will drive the FET until the voltage drop across Rsense is .5 V. Since Rsense is 100 mOhm we know that 5 A of current is flowing out of the PV panel through Rsense (Ohm's law: .5 V/.1 Ohm = 5 A). The 34972A's built-in 61/2 digit DMM combined with plugin MUX switch cards allow us to measure voltage, current, temperature, and more on a large number of channels. In the figure we use one channel to measure the PV panel's voltage, another channel to measure the panel's current (voltage measurement across Rsense), and two other channels to measure temperature. Putting it all together the way we get the I-V curve is by stepping the DAC's voltage up from 0 V (panel at Voc) until we reach Isc. At each step we measure the panel's output voltage and current to get our I-V curve. 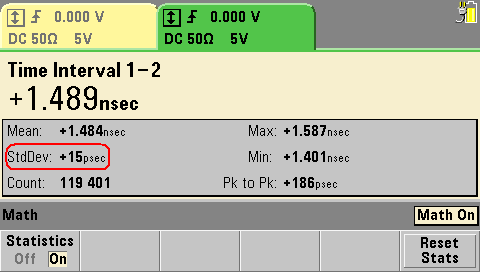 The way we know we have reached Isc is when further voltage steps from the DAC do not result in the voltage across Rsense increasing. At this point the FET is essentially a short. This photovoltaic I-V curve measurement system will not work well with low voltage low power PV cells since Rsense and the FET cannot actually become a true short. It is better suited for PV modules and panels. 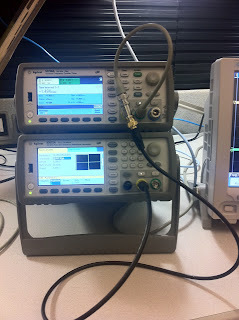 Although the hardware is low cost you do need to wrap some type of software around it to control the DAC and gather the measurements (unless you want to do it manually). The value of Rsense and its power handling capability should be chosen based on your PV device's power range and your measurement accuracy needs. Below is a list of parts I used and their approximate cost. This was just a brief overview of the solution if you need more info just comment or email me.